The NBC Connecticut Troubleshooters have learned that Gov. Dan Malloy is requesting that the Federal Emergency Management Agency get involved with the crumbling foundation problem in Hartford, Tolland and Windham counties. In a letter to FEMA Administrator Craig Fugate, Malloy asks the agency to establish a field office in northeastern Connecticut to conduct a preliminary damage assessment to determine the extent and impact of what he describes as approximately 34,000 homes in the area with foundations that could be at risk of crumbling and actually collapsing. The governor explains that potentially tens of thousands of Connecticut residents are at risk. He notes that while the state, municipalities and a coalition of insurance companies have been collaborating on a strategy to address this problem, federal assistance and the expertise of FEMA are critical. 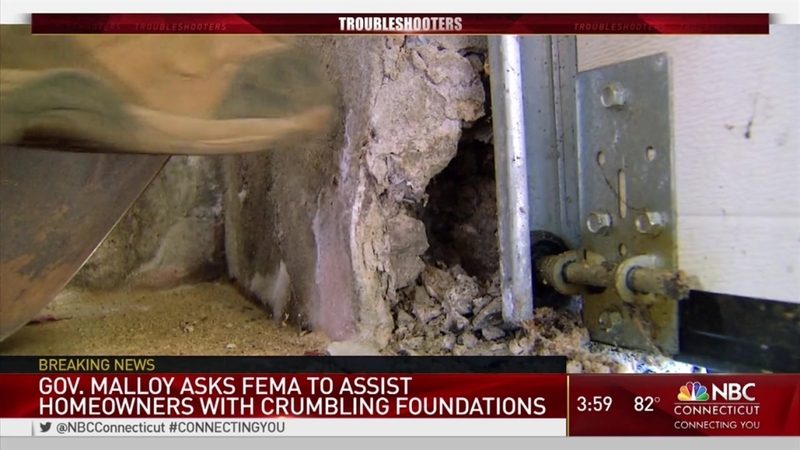 In April 2016, the state reached out to FEMA, but at the time the agency felt the crumbling foundation issue did not appear to constitute an emergency or major disaster. Since that time, a state investigation concluded what the NBC Connecticut Troubleshooters reported nearly a year earlier, that a chemical reaction involving a naturally-occurring mineral called pyrrhotite causes the in deterioration. Now the state believes this is a natural disaster which will require assistance from FEMA to solve what could be a $1 billion problem. Governor Malloy, in collaboration with Lt. Governor Nancy Wyman, who has undertaken a leading role on this issue on behalf of the administration, continues to work with the various stakeholders involved in this issue – including homeowners, municipal and state officials, the state’s federal delegation, and the insurance industry on this problem. “While none of us can fully grasp the full weight this disaster has placed upon these homeowners, it is vital that we all come together to assist them,” Malloy wrote.